THE roar of trail bikes through escarpment bushland is not only damaging the sensitive environment, but could cost riders fines of up to a thousand dollars. Police and Wollongong City Council are on a trail bike education campaign during April. The campaign is designed to ensure trail bike riders, their parents and community members are aware of where it is legal to ride trail bikes. 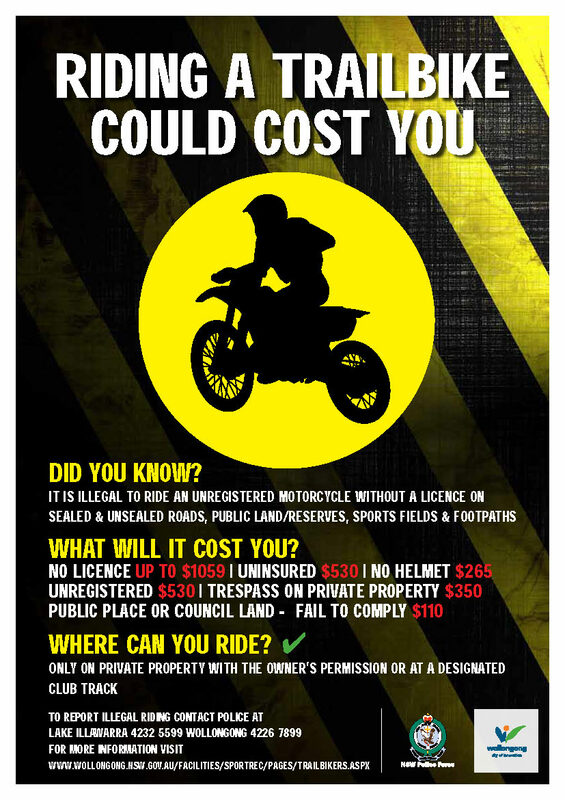 The campaign will also feature educational material and posters and NSW Police will be involved in an operation in two areas of the city to discourage trail bike riders from riding illegally. Wollongong Lord Mayor Gordon Bradbery said trail bike riders are often unlicensed, riding unregistered bikes and taking high risks riding where they shouldn’t be riding. “Council is also aware that young riders are riding through community sporting grounds as well as around school areas when many pupils are around,” he said. Illegal trail bike riding should be reported by contacting police, the Lord Mayor said. People should also collect information such as the registration number, the address where the bike was last seen at, and as many other details as possible such as the colour of the bike and a description of the rider. It is illegal for any person to ride an unregistered motorcycle without a licence on sealed and unsealed roads, public lands and reserves, sports fields and footpaths. Riders could receive fines of $1,059 for riding without a licence, while other fines include $530 for riding an uninsured bike, $265 for riding without a helmet, $530 for being unregistered, $350 for trespassing on private property, and $110 for failing to comply by riding on Council land or a public place. Parents should be aware that there is a range of fines that could also be issued to them if it is their child who is riding the motor bike illegally.